3 years ago, when our 2nd baby was just a few months old, we thought it would be a super cool idea to rip out all the tile and carpet in all the living areas of our house and our kitchen and install 1100 square feet of real hardwood floors. Ourselves. It was A LOT of work, and we definitely went A LOT crazy while doing it. But we don’t regret it one bit. We LOVE them even more every year. Our total cost for the project, including all aspects of installation, finishing, supplies, and what we spent on eating out while our kitchen was unusable was $5,000. That works out to about $4.55 a square foot, all expenses, rentals, and contractors included. Check out a screenshot of our spreadsheet of expenses, along with a list of exact materials used here. Over the years, I’ve received so many emails and comments asking me how we like them, if we’d change anything, if we’re happy with how we sealed them (skipping traditional stain and poly). So I thought I’d take some time today to answer some of the most popular questions I get. 1. Where did you get the wood? We found the best price at Lumber Liquidators. It’s UTILITY Oak 3/4″ x 2 1/4″. It’s the cheapest real wood option because there are a LOT of irregularities. There are knots you need to fill before finishing, there is discoloration. Many pieces aren’t straight, many are cracked, many are not useable. For that reason, you have to buy at least 30% more and then manually pick through it to sort out the pieces suitable for your floor. All of that said, it’s still a very inexpensive option for what it is, and you’ll have tons of pieces left over for fun projects. My husband built our kitchen table with leftover pieces, and our headboard. 2. How did you install them? My very handy husband and his brother, who is in construction and offered a ton of help, took on the whole project of actually installing the floors themselves. Our home has a concrete foundation with no subfloor. So they had to first cover the concrete with a plastic barrier, then drill a plywood subfloor into the foundation to protect the floors from potential moisture. We aren’t 100% sure this is 100% necessary, but we did a lot of research on it, and felt we wanted to do everything we could to make these floors last a long time. There was also a layer of felt-quality roof/deck protection that went over the plywood subfloor (bought from Home Depot) before they began installing the actual floor. They used a professional grade staple-gun to install the pieces of the floor, starting at the back of the house, working up to the front from left to right. It’s VERY important you begin laying the pieces in a straight line. 3. How did you finish them? We originally planned to sand and finish them ourselves, but eventually thought better and hired someone on the cheap to come and sand for us. We didn’t feel they did a great job, but they definitely did better than we could have. They charged us $1,000. You really have to be careful with the sanding because it’s very easy to mess up this part if you’re not very experienced, and that alone can ruin all your hard work. We did, however, apply our own finish. We opted for a clear Monocoat Natural Oil finish. It was easy enough for us to apply ourselves in a day, and it dried quickly. Not to mention it’s a healthy, safe option with 0% VOCs and other harmful chemicals. 4. How long did it take you? The actual install of the subfloor and wood took 5 FULL days with 2 men working on it. We’re talking a few days where they nearly worked through the night. The sanding took just a few hours (remember we hired out for that), and the finishing with the Monocoat took about a day to apply, then time to let it dry. Ultimately, it took about 2 weeks from ripping stuff out to having a livable house again. 5. Are they hard to clean? Do they look dirty easy? They are actually super easy to clean. We sweep them frequently, and even use our Dyson on them (on the hard floor setting). We mop them once every few weeks or as needed, using a special cleaner from Monocoat that has lasted us a lonnnnng time. The variation of color in the wood in combination with the matte finish of the Monocoat means they camouflage dirt and dog hair beautifully. Scratches happen. We have a dog and 3 kids. We LIVE in our house, and we don’t stress about keeping these floors pristine. A lot of minor scratches just blend in to the other imperfections of the wood, giving it more of an aged, lived-in look that we really love. The big scratches can be “healed” a bit by cleaning them well and applying a single layer of Monocoat to the scratch again. No need to sand the area. It’s really one of the best features of using the Monocoat finish. Note: The spot where you apply a fresh coat of Monocoat over a scratch may appear darker for a bit since the floors around it are more worn in. Over time, this becomes less obvious. It’s not something that really bothers us, but again, we are okay with the lived-in, imperfect look. 7. How are they holding up after 3 years? Beautifully. They have aged really well, and the imperfections continue to give them character. There are some spots where epoxy that we used to fill in knots have come loose, and we’ve had to refill those. There are some ragged spots where wood has chipped away from some cracks in the wood. Nothing huge or defective. Just… imperfect. I would not suggest this route for anyone who wants a polished, pristine floor. Have kids, dogs, make messes, don’t want to worry about keeping your floors shiny? This is a great option. 8. Would you do it again? Without a doubt we would like to have these floors again. If/when we build or renovate another home, we will for sure strongly consider this option. Though, this time we will hopefully hire someone to install them for us. 9. What about when they get wet? Because the Monocoat isn’t a thick, waterproof layer like a polyurethane finish would be, water can seep into the floors if left standing on it too long. It’s not an issue to mop them because we aren’t pouring gallons of water onto the floor and leaving it to sit. It’s not even an issue when we spill something because we just wipe it up. Liquids don’t immediately seep into the floor. We just make sure to keep “floor towels” handy to clean up accidents. But, if water stands long enough, it will penetrate the Monocoat and can cause warping in the wood. This happened pretty bad around our dishwasher before we realized it was leaking underneath the kitchen floor. The GREAT news is you can’t even tell now. We replaced the dishwasher, fixed the leak, and time healed the warped wood as it dried out. 10. Would you change anything? I would hire someone to install, sand, and finish them for us, assuming we had the budget for it next time. I would also try to get the wider 3/4″ x 3 1/4″ boards. We originally wanted these, but there was a very long wait for them. 11. What do you love most about them? It’s really cool to say we did this ourselves. We take a ton of pride in our house, largely because of how much work we put into these floors. Scott and I have both admitted to each other that we are fully prepared to cry when we sell this house. Have any other questions? Please ask away! I will do my very best to answer them, or get my husband to help me answer them. If you want to be sure I see your comment, make sure to leave it in the actual blog comment section and not the Facebook comments, since I don’t get notifications for those. hahaha. Maybe a bottle of pinot will help seal the deal for us! With two under three, we’ve already got the sleep-deprived thing down pat. Thinking we were being smart, we thought we would “save money” and go with the hardwoodesque vinyl flooring. Hindsight being 20-20, we should have just spent that extra money for the gorgeous floors you have! Totally jealous! You indicate you used a staple gun to install, are there still staples visible on the floor? Or how did you hide? Not a typical staple gun. It’s the kind of gun you use to install hardwood floors. You can rent it. So no, the staples don’t show. They are hidden in the seams between the boards. So beautiful. Nice job! How did y’all rip up the tile? Was it ceramic? We are buying a house that has ceramic throughout the whole bottom floor, and we want to DIY install wood instead. Ugh. Yeah… the tile was a beast. We had ceramic tile in our entry way and in our kitchen. The kitchen tile was REALLY stuck on there and we had to rent a jackhammer. Still, that didn’t make things easy. Dang, not what I wanted to hear! Haha. I figured we’d need a jackhammer. They make it look so easy on DIY Network and HGTV! Oh yay! We are really very happy with it, and it’s so hard to find reviews out there. Good luck! A good DIY hardwood floor installation guide for someone who is completely new to do this job. You can also try http://www.yourfloor.net/products-services if you need any help, tips on installing hardwood floors. Did you tackle the baseboards yourself too or did you contract that out? I love the wall color by the fireplace! What’s the name of it? Did you fill any of the larger gaps with wood putty(if so what brand)? Wondering if the Rubio will stick to the putty or not. If you didn’t fill the gaps, does the Rubio “fill” or “drip” into the gaps and dry or not dry?? Any advice you have would greatly appreciated!!! Hey Jess! We used a putty stick, I think by JB Weld? to fill those big holes. The Rubio seemed to stick/cover it fine. Keep some sticks on hand in case some holes lose the putty. It may dry and crack over time. It was never a huge deal because we tried to sort through the wood really well on used pieces with bigger holes and cracks (if we HAD to) in low traffic areas. Good luck! 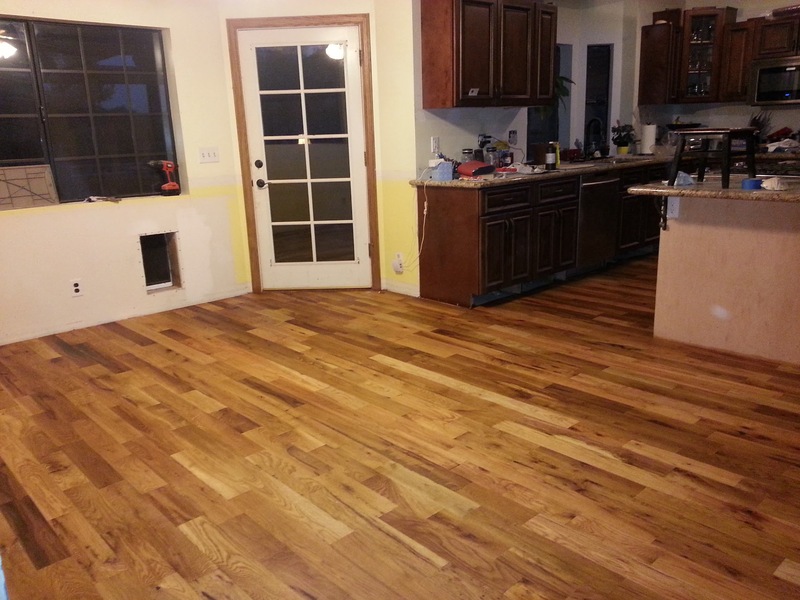 We did our floors about the same time you did yours…but nearly 3000sf. Same utility grade oak from LL, and Rubio Monocoat. We used fiberglass resin to fill holes and gaps, they have a depth to them, rather than being one color. They sanded well, and oiled well too. We have 4K SQ ft of this beautiful flooring. We absolutely love them. All sorts of imperfections and I filled knots. They are 12 years old and worth every penny. Our kids drove, rode, dragged everything you can imagine through our house and I never worried for a second while my neighbors would be unnecessarily worrying for me. Adding floors to bedrooms now. I love your floors! I too installed utility oak in one of my bedrooms 6 years ago and they have held up pretty well, but my installation process was a tad different than yours; I did a lot of research and what I finally decided to do was buy a product used as shower and bathroom moisture barrier called Redgard waterproofing membrane, I just rolled that stuff on the floor with a paint roller and when it dries is like a plastic coating and also bought the flooring glue with moisture barrier just to be on the safe side, I stayed away from pieces that were split but other than that I installed all the pieces with knots and holes and ended up filling them up with the sawdust and wood glue after trying to no avail the wood putty that could not be stained no matter what i did in a test, for stained I used a mix of cherry and pecan and it turned out great, however 6 years later i am ready to go to a darker stain and floor is gorgeous!Over all i spent around $500.00 total and I am planning to install utility oak all over the house in the future. (p.s) this is not a paid advertisement, just my own experience. Did you run into issues with the mix of v-groove and sqaure-edge pieces? LL says you could get a mix and so trying to decide if that causes extra challenges with install & look. Thanks! The floors look great! What color of Monocoat did you use? Good article. Keep up the fantastic work!